Mining District Bylaws for Idaho mining Districts. I am looking for the original bylaws for Yankee Fork and Bayhorse in paticular. They were formed in the 1870's when it was Alturas County when Idaho was a territory. I am trying to find mining district bylaws for Mining Districts in Idaho. I am looking for the Yankee Fork and/or Bayhorse mining district in particular, others would be useful. Yankee Fork district was organized in 1872 when Idaho was a territory and part of Alturas county which no longer exists. I have check many of the local and State sources that I can think of. Any suggestions would be appreciated. Re: Mining District Bylaws for Idaho mining Districts. I am looking for the original bylaws for Yankee Fork and Bayhorse in paticular. They were formed in the 1870's when it was Alturas County when Idaho was a territory. Your efforts already sound pretty thorough. Unfortunately by-laws for traditional mining districts are not government records so the National Archives is unlikely to have them. That being said, this ICMJ Prospecting and Mining Journal Website provides links to sections of a scanned, 1880 Census Office record of existing mining laws and by-laws of traditional mining districts. Ignore the site’s instructions since they are not helpful in your case; unlike nearly every set of mining by-laws, some Alturas County mines are not sub-arranged under their state’s name and the one provided below might have that distinction. Near the bottom of that Webpage are hyperlinks to PDFs of the 1880 Census Office record. Click the link 1880a_v14-09 - pg 468-540 and scroll to pages 502 and 503, which is a copy of the Yankee Fork Herald’s account of an 1879 meeting in Galena City, Alturas County. It describes the persons at the meeting and the by-laws adopted. We hope this is what you are looking for. 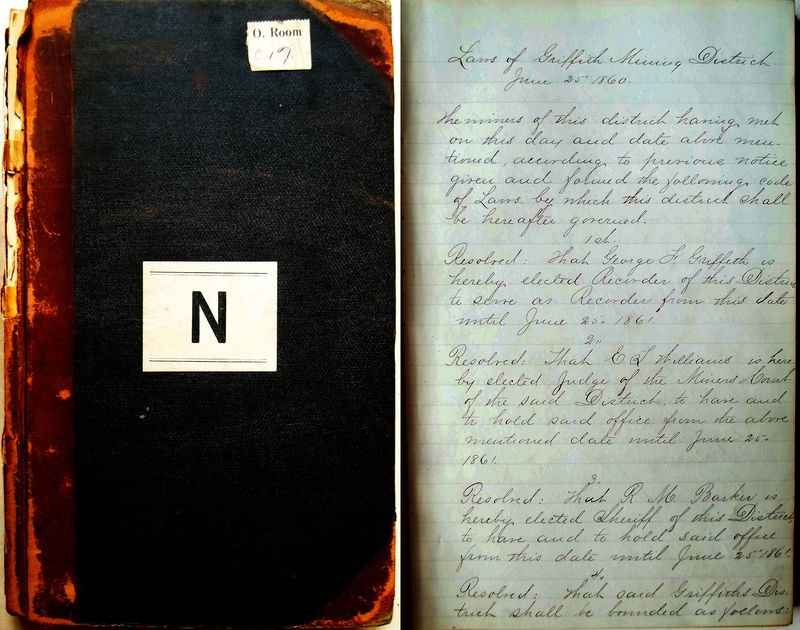 On the off chance you are looking for Government Land Office records on Mineral Districts, we suggest you contact the NARA office in Seattle at seattle.archives@nara.gov . This is close to what I am looking for. I would think that most of the bylaws in the area were the same with just the boundary lines different. I won’t know for sure until I find them? Thanks for your help, let me know in you discover anything else. The entry describes the mining district by-laws of a district in Colorado in 1861/61. However, there appears to be little difference in the by-laws of many districts. There seems to be a thread through all of them, based on common-law reasoning, and the traditions of mining. Based on antecedents from the colonial era and the early republic, the American style of placer mining seems to have been firmly established by 1849 when the California stakes were opened, and these 49'ers spread the traditional rules throughout the west. The rules in Colorado in 1860 will bear a strong resemblance to rules made in other districts, especially when the mineral being sought was gold. Certainly, the 1860/61 Colorado by-laws represent the traditional mode of operation, as the federal placer & lode mining laws weren't passed till 1866. I would imagine that the by-laws of the mining districts of Idaho were little different. Colorado Mining District By-Laws (sample), from NARA RG49, entry ud-835, ARC 5719206; (photo by Jonathan Webb Deiss, 2015). This might have some good information, I will need some time or instruction on how to look thing up? Thanks for the information I will try to maneuver through the site when time permits. As I said before the National Archives is unlikely to have mining district by-laws since they are not government records. That doesn't mean they are not here--just that their retention might be coincidental or not called out in the record. Indeed, the link provided above seems to be the only by-laws in the catalog. "Mining District" is something of a confused term because it is occasionally used in the place of "Mineral District," which Mr. Deiss refers to at the end of his reply. If you are also interested in borders, the Government Land Office (Record Group 49) mineral districts would certainly be the way to go. I'd still recommend contacting the Seattle office mentioned earlier but add the downtown D.C. office, which can be reached at this e-mail address: Archives1reference@nara.gov . Mining district by-laws are occasionally part of the federal record, especially when included in mineral patent application case-files for the adjudication of claims made prior to the enacting of the Placer and Lode acts in 1866, or in cases where mining was undertaken before the land was taken up by the public domain, or prior to some jurisdictional change, as happened in Deadwood in 1876. In the same manner as pre-emption cases, the miners might include copies of local mining district by-laws in the applications, to have their prior stakes recorded in the Land Office registers and tract books, and to show they abide by the local mining-district rules. They are, however, not described in the catalog in that manner, but are likely to be located in the Division N files. There is a method to my pedantic madness : You could look up claimants and entries made in the Land Office where the mining district in question was located (BLM database, here : IIS7 ). Then, at the Nat'l Archives, you could search the case-files of early mineral patent entry-men, and examine the papers to see if copies of local mining district by-laws could be included (see : https://catalog.archives.gov/id/300276). Another approach could be to look at cancelled and rejected mineral patent case-files, (described here : https://catalog.archives.gov/id/7586262). All of this could be fruitful, assuming you have time and resources to conduct a through search using similar methodology and patience. The fact that I have located these items more than once leads me to believe that it was not unheard of for them to be included in patent application case-files. Looking for especially large bundles of case-file notes are a good indication of 'additional paperwork' being included.